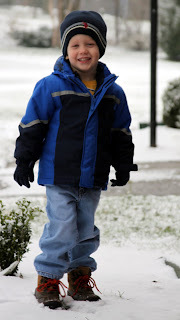 the other tomorrow: Snow days! Today was our first day with snow! Let me just say that for Tate that was so exciting. Of course it takes you almost as long to get dressed for the snow as it does to actually play in it. We ran and chased each other and threw snowballs he wanted to make a snowman but with only an inch of snow that doesn't work out really well. Here are some pics of T in the snow! OH yes and how could we forget his favorite toy his mower he had to try it and finally set it aside and declared it's too hard in the "now"! Haha! 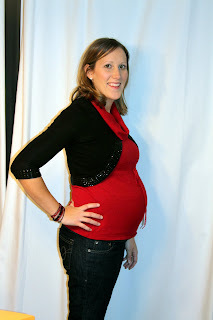 OH yes and for those interested I thought I would post a pic of my updated belly! He's growing growing growing! I'm almost 27 weeks so hard to believe and so exciting!